Free Shipping Included! 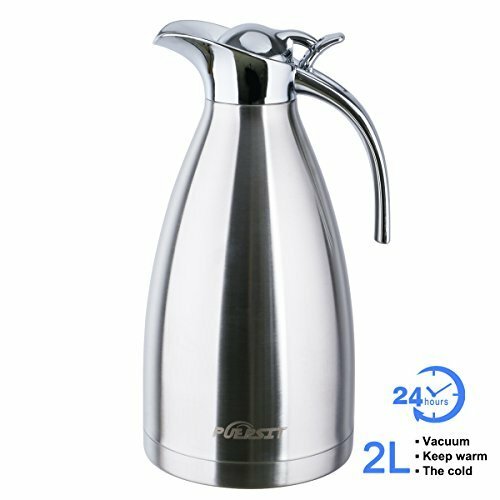 68 Ounces Large Stainless Steel Thermal Coffee Carafe-2L Double-Wall Insulated Vacuum Thermos Jug-24 Hour Heat/Cold Retention for Coffee Hot Water Pot Hot Beverage Dispenser by Puersit by PUERSIT at Rat Coffee Shop. MPN: RQN. Hurry! Limited time offer. Offer valid only while supplies last. High Quality Material: Durable & Stylish 304 Stainless Steel food grade safety materials, BPA free, environmentally friendly, to ensure drinking water safety and health. Large Capacity: The 2 L capacity is essentially 68 ounces. Size: 12 Inch * 5.5Inch ( 30cm X 14.5cm).Apply to coffee, tea, juice, milk and boiled water. With medical grade silicone sealed performance is good non-toxic odorless. Double-Wall Insulated Carafe: Double-wall Insulated design, more safety and longer keep hot or cold time. It is more health use stainless steel than plastic when it come to hot water. And that won't rust, scratch, pit or break.Completely vacuum treatment, to ensure long-term insulation effect. Wide Spout: When you pour hot or cold drinks into thermos, avoid overflows, drips and spills. You can even add enough ice cubes to make you drinks or beverage keep cold for longer time. Wide mouth also makes it easier to clean in thermos. Ergonomic handle & Beautiful and Functional Carafe: Elegant and beautiful design gives you a better sensory experience. This is a brilliant pot, tea and coffee remain fairly hot. Not only does this jug look good when used but kept liquids hot or cold for a long time, which is great. If you have any questions about this product by PUERSIT, contact us by completing and submitting the form below. If you are looking for a specif part number, please include it with your message.